Clinical Studies show that Celergen helps to improve stamina, as well hasten recovery after exercise. Clinical Studies Show That Celergen Boosts Stamina as Measured by Oxygen Consumption During Exercise. Oxygen consumption, also known as VO2 Max, is the maximum rate of oxygen consumption measured during incremental exercise. It reflects the cardiorespiratory fitness of an individual. The average untrained healthy male will have a VO2 max between 35-40 Ml/(kg*min), while the average healthy female will have a VO2 max between 27-31 Ml/(kg*min). A clinical study on healthy, untrained subjects was conducted to show the effect of Celergen on Oxygen Consumption (VO2 max) after 21 days. At the start of the study the subjects’ average oxygen consumption (VO2 max) was 38.3 Ml/(kg*min). After just 21 days, the average consumption increased to 39.6 Ml/(kg*min). At 65 years old, I had just completed my 39th Ironman Triathlon. This was the first race I had competed in since starting Celergen. I placed 3rd in my age group, which is the best I had ever done. I felt good the entire day and had a supply of both mental and physical endurance that was amazing to me. Even more amazing, was that unlike before – when it was over – I was ready to start training again after only a week. I know that Celergen really works! 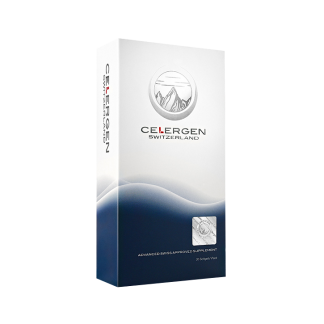 A Clinical Study Shows that Celergen Helps to Improve and Hasten Post-Exercise Recovery. Proper recovery after exercise and vigorous activity is essential for continued health – both physically and mentally. Failed recuperation leads to potential long term injury and set back. 30 Athletes with an average of 20, were tested with Celergen for 31 days. 80% reported improvement in their post exercise recuperation – leading to faster turnaround and recovery.